Adjectives! 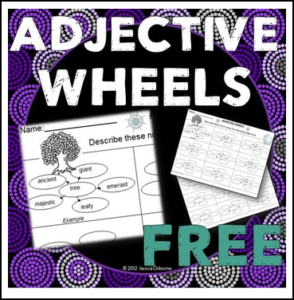 These wheels are used to help students practice creating interesting adjectives to describe nouns. The first page has the nouns listed for the students to describe as well as an example of what choosing an “interesting” adjective looks like. For example, “giant” instead of “big,” and “emerald” instead of “green”. The second page allows their imagination to lead them to choosing their own nouns to describe. A group discussion after completing the first page would allow students to compare answers and share reasons for their adjective choices before going on to the second page on their own. This often leads to the students striving for even better, higher quality adjective choices on the second page. Move on toward using adjectives in their writing with Adjectives Exploration! Click HERE to see all my products about ADJECTIVES! (C) 2012 Jessica Osborne. All rights reserved.